Federal Judge Rules Graphic Cigarette Labels Violate Constitution : Shots - Health News U.S. District Court Judge Richard Leon in Washington ruled that a requirement for cigarette makers to put large, gruesome labels on their products violates free speech rights. Foes of the tobacco industry urged the Justice Department to appeal. One of the cigarette labels a federal judge says goes too far. Scary labels the U.S. Food and Drug Administration would require on cigarette packages later this year were nixed today. U.S. District Court Judge Richard Leon in Washington ruled the requirement that cigarette makers put the labels — some quite gruesome and all quite large — on their products would "violate the First Amendment by unconstitutionally compelling speech." Five tobacco companies, including R.J. Reynolds and Lorillard, are plaintiffs in the case. In November, the same judge had granted a preliminary injunction to block the labeling rules, a decision the administration appealed. Now, he has sided with tobacco companies in a 19-page summary judgment. "We have no comment," a Justice Department spokesman said in an email to Shots. In a footnote to the ruling, the judge said that calling the labels "graphic warnings" doesn't go far enough. "They are more about shocking and repelling than warning," he wrote, adding later that the images serve as a deterrent to people buying cigarettes. In an interview with NPR last June, FDA Commissioner Margaret Hamburg said the labels are stark on purpose. Various studies showed that existing warnings, such as "Cigarette Smoke Contains Carbon Monoxide," had lost their power and effectiveness, she said. "We absolutely believe that these warning labels will make a difference," Hamburg said. She expressed confidence in the approach based on studies in other countries where graphic warnings have been used for years. But Judge Leon faulted the labels as being inaccurate and lacking in proof. He cited, for example, one label that shows a body on an autopsy table (see above). He said the FDA didn't show that autopsies commonly result from smoking. The government also didn't provide facts on the label to back up the claim in legal arguments that the image is a symbol for 443,000 smoking-related deaths in the U.S. each year. "Put simply, the Government fails to convey any factual information supported by evidence about the actual health consequences of smoking through its use of these graphic images," he wrote. 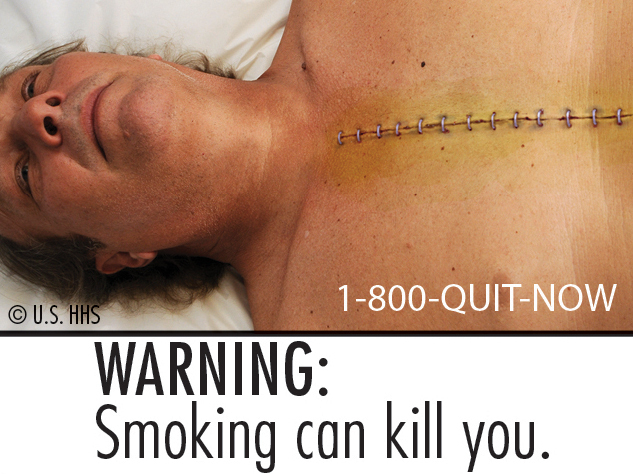 The mandate requiring these repellent images and messages to quit smoking poses a constitutional problem, he wrote. "Although an interest in informing or educating the public about the dangers of smoking might be compelling, an interest in simply advocating that the public not purchase a legal product is not," he wrote. In the end, he concluded that Congress didn't think through the free speech issue raised by the law directing the FDA to regulate tobacco like this. Foes of tobacco were dismayed by the decision. "Judge Leon's dangerous ruling blatantly ignores significant scientific evidence supporting the effectiveness of larger, graphic warning labels in communicating the health dangers of tobacco use," said a statement from Dr. Robert W. Block, president of the American Academy of Pediatrics. The group urged the federal government to appeal the ruling.